INWOOD — One of the city’s first prefabricated residential building to come to Inwood is near completion. The Stack, a 38,000-square-foot, seven-story concrete and steel building, was shipped to 4857 Broadway in 56 separate modules. Placement of the modules started in late June and will be completed Wednesday by an eight-person crew and one crane. Posted in Building Spotlight and tagged Inwood, New Development, NYC, nyc real estate, Prefabrricated, Rental Property, The Stack on July 20, 2013 by NY Living Solutions. 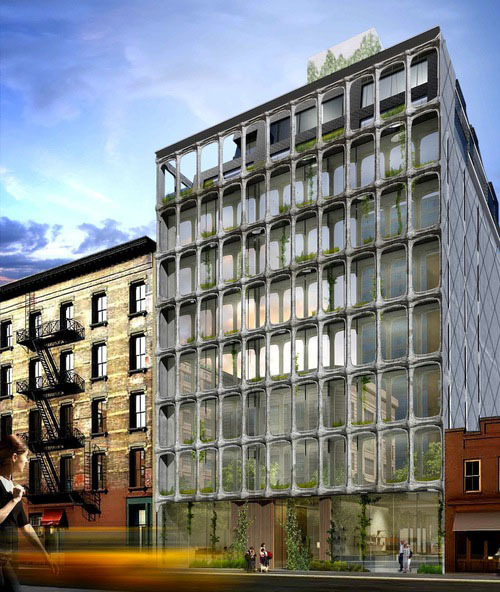 A particularly ugly part of West Broadway in Soho will soon become unimaginably better. The best thing that can be said for the existing structure at 325 West Broadway, at Grand Street, is that in the days when things were still manufactured in New York City it used to be a factory that produced Tootsie Rolls — those delicious, caramelized confections that we all remember from our younger days. Now I yield to no one in my reverence for Tootsie Rolls, but that does not obscure the fact that the drab and unadorned building from which so much joy once issued is itself an eyesore, confected out of bare, albeit vaguely caramel-colored, brick. All of that is about to change: the development firm of DDG has gotten the go-ahead from the Landmarks Preservation Commission to tear down the factory and put up a luxury condominium. DDG revealed new renderings for the project earlier this month. Standing nine stories plus a rooftop penthouse level, the building will have seven units ranging from 3,000 to 6,000 square feet. The results, to be completed in 2015, will look especially good when viewed beside the drab 19th century pile to its left, which could also profit from the strenuous ministrations of a developer. Posted in Articles, Building Spotlight, New York City Real Estate, Real Estate and tagged condos, Landmarks Preservation Commission, LPC, New Construction, NYC, SoHo, Tootsie Roll Factory, West Broadway on March 25, 2013 by NY Living Solutions. Whole Foods, Brooklyn – City Council voting starts soon.. Whole Foods Market Inc. faces a series of City Council votes starting next week to win final approval for construction of a 52,000-square-foot supermarket next to a 140-year-old landmark in Gowanus, Brooklyn. The new store is planned to wrap around two sides of the vacant Coignet building, the city’s earliest known concrete building, at the corner of Third Avenue and Third Street. 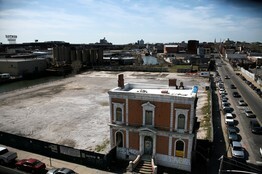 After expected council approvals, the grocery chain would be allowed within five feet of the old building and wants to have its first Brooklyn store open in 2013. Built in 1872 for the New York & Long Island Coignet Stone Co., the 2½-story building is the sole survivor of a five-acre industrial park built along the Gowanus Canal in the early 1870s. The elegant Italianite mansion provided office space for Coignet and subsequent companies, including its longest-running tenant, the Brooklyn Improvement Co., from which Coignet leased the land for its stone works. The building received city landmark status in 2006. Two City Council panels overseeing landmarks and planning will vote next week on whether to reduce the Coignet building’s lot size to about 1,720 square feet from 6,250 square feet, a measure that’s already been passed by the Landmarks Preservation Commission. If approved, a full City Council vote on the measure is slated for April 18. Posted in Building Spotlight, New York City Real Estate, NYC and tagged Big Box Retail, Brooklyn, City Council, Coignet, Gowanus, NYC, Whole Foods on April 5, 2012 by NY Living Solutions. CIM Group and New York developer Harry Macklowe are making strides toward building the tallest residential building in New York City at the Drake Hotel site at 440 Park Avenue. They filed a plan examination request for the building, one of the first steps towards getting a development off the ground, with the Department of Buildings, according to a DOB filing dated March 26. The California-based real estate investment trust filed its plans for an 82-story condominium tower for review to DOB, which will check if its plans are in compliance with building code, a DOB spokesperson confirmed, saying an examiner had not yet reviewed the filing. The filing cites the height of the building as 1,397 feet in total, which would make it the tallest residential building in the city; for comparison’s sake, One57, Extell Development’s planned condo tower on 57th Street will be 1,004 feet tall upon completion in 2013 and the Empire State Building, the tallest structure in the city, is 1,453 feet in height. As previously reported, CIM, (which acquired the site for $305 million last year), and Macklowe plan to erect a slim condo and retail complex designed by Uruguayan-born architect Rafael Vinoly at the site. It is slated to have 128 units and 12-foot high ceilings. The $1 billion project will include a 5,000-square-foot driveway, golf training facilities and private dining and screening rooms, according to previous reports. Neither CIM nor Macklowe immediately responded to requests for comment. Posted in Building Spotlight, New York City Real Estate, NYC, Real Estate News and tagged 440 Park Avenue, Charles Garner, CIM Group, DOB, Drake Hotel, Macklowe, NYC on April 2, 2012 by NY Living Solutions. Members of Midtown Community Board 5’s Landmarks Committee scrambled to weigh in on the Commission’s plans, which they were notified of just two hours before their monthly scheduled meeting Tuesday evening. The Commission is set to hold a public hearing on the designations on Oct. 26. The first building, the 12- story Hotel Wolcott on W. 31st between Broadway and Fifth Ave, was designed by architect John H. Duncan, the man behind Grant’s Tomb in Riverside Park and the Soldiers’ and Sailors’ Memorial Arch in Brooklyn’s Grand Army Plaza, according to descriptions provided by the Commission. The spectacular panoramas that residents enjoy at 15 Park Row are classic and inspiring. Breathtaking East River vistas, from sunrise to sparkling night bridges, are complemented by celebrated views of the Woolworth Building and of course, the elegant greenery of City Hall Park. 15 Park Row carries the illustrious architectural heritage of design by the renowned R.H. Robertson. It was at one time, from 1899 – 1908, the worlds tallest office tower. Its ornate twin towers remain a signature presence among downtown manhattan’s most celebrated landmarks. Please visit www.15-parkrow.com for more information or call the Rental Office at 212.962.3940 anytime.